Postgraduate study involves hard work and commitment, but success can bring with it a range of benefits, some personal, some professional and some financial. These include improved career and promotion prospects, the chance to change career direction, intellectual development and access to all of the University’s excellent facilities. How do I choose between a taught course and research? The choice between taught and research programmes is often influenced by your long term career objectives, the reasons for returning/continuing your study, and what you are hoping to achieve from your postgraduate study. If in doubt ask a supervisor or lecturer, or get in touch. What are the differences between taught and research postgraduate programmes? Taught courses usually consist of a number of modules and units, which are assessed by a mixture of continuous assessment and exams. There will be a set amount of contact time with the course providers, which will take the form of seminars, tutorials, lectures and one to one contact with a member of the department. The final assessment for a Masters degree is often based on the submission of a dissertation. Research degrees are usually assessed entirely by a piece of individual research and an oral defence of the work in front of an examining board. They can generally be divided into Masters degrees and Doctorates. The research Masters degree, for example usually lasts for two years and requires the student to produce research papers. For both Masters by research and Doctorates, your supervisor is responsible for guiding the direction of your research, and for ensuring that you are on schedule. Many people consider taking a postgraduate degree immediately or within a year or so of graduating. An alternative strategy may be to consider taking a postgraduate qualification with the approval and financial support of an employer who will take into account the benefits to the organisation of the postgraduate training you will gain. You may also consider taking a postgraduate degree part-time, while you are working, for both personal and professional development. You may decide to follow a new career path and support this with a postgraduate qualification. Do not make arrangements to come to the University until you are sure that you have funds of your own, or confirmed sponsorship to pay your fees and living costs on time for full duration of your course. The programme duration for a full time student is between 2 to 4 semesters, whereas a part time student is between 4 to 8 semesters. How much will a postgraduate degree cost and how are postgraduate degrees funded? Downloadable lists of tuition fees for postgraduate taught and research programmes are available on the http://pkukmweb.ukm.my/pps/index_en.php . If you are considering applying for some kind of studentship, you will usually need to have a firm offer of a place to study before you will be considered for an award. For local students you may seek funds from https://payloan.mohe.gov.my/MyBrain15/index2.php. For international students; http://pkukmweb.ukm.my/pps/index_en.php# under Fellowship and Scholarship section. These programmes are delivered via a range of teaching methods including lectures, assignments, seminars, case studies and a dissertation or project. Examination may take various forms, including written examinations, assessed course work, project work, etc. What are the entry requirements for a taught course? All applicants must satisfy the general postgraduate admissions requirements and also those of the course which they wish to pursue. 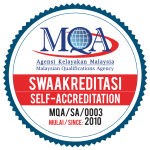 The minimum requirement is with a CGPA (cumulative grade point average) of 2.70 from any local or overseas university or higher institution recognized and approved by UKM. Applicants who do not meet these criteria may be considered provided they have a minimum of 3 years experience in a position of responsibility relevant to the proposed course of study. What English language requirements do I have to meet? TOEFL (Test of English as a Foreign Language) with a minimum score of 550 in the paper test. Attend and pass the English Proficiency Module in UKM as a prerequisite for entry into graduate programmes at UKM. I can’t attend the course this year. Can I defer to the next intake? A student seeking leave of absence on medical grounds must provide a medical certificate. All application for deferment shall be made in writing to the Faculty Graduate Office, after consultation with the supervisor. This must be made within 4 weeks from the date of registration. The period allowed for deferment of study is not less than 1 semester and not more 2 semesters. Do I need a visa to study in Malaysia? Full student visa information is available on the Immigration Department of Malaysia’s website at http://www.imi.gov.my/index.php/en/visa. Once a student has formally accepted a place at UKM and has the funds (or proof of funds) to support her or himself in this country, s/he is usually to obtain visa without much difficulty. How do I get an entry visa? Once you have received an acceptance letter from UKM, you should visit the nearest Malaysian Embassy or Consulate in your home country to obtain the entry visa. Once arrived in Malaysia, the University will obtain your student pass on your behalf from the Kuala Lumpur Immigration Office. How do I open a bank account when I arrive in Malaysia? What are the estimated living costs for students? Living expenses may vary depending on the students’ financial resources, tastes and interests. Students are advised to set out a budget according to their individual needs. The cost estimation of food, accommodation, local travelling and other personal expenses for self-supporting single student is to be around RM 1000 (USD 266) per month.